The story for discussion will be “The Mazarin Stone” published in the Strand Magazine and in Hearst’s International for October 1921. Narrated in the third person, this adaptation is based on a one-act play, “The Crown Diamond: An Evening with Sherlock Holmes“, written by ACD. The stage is set! We see scientific charts on the wall, an acid-charred bench of chemicals, a violin case in the corner and a coal scuttle filled with pipes and tobacco. New to 221b is the curtain across a bow window, which allows room for a chair. The story also features Billy – the boy in buttons, who welcomes Dr. Watson, which informs the reader that the good doctor is living elsewhere. 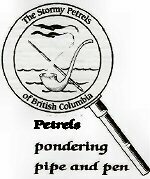 The Stormy Petrels will meet at their usual venue – Hampton Place lounge at UBC, starting at 7:00 pm, Tuesday, December 4th. We will be setting up our Petrel Tree – decorated with ornaments representing each of the 60 stories of the canon. Please feel free to bring such an ornament. BONUS QUESTION: What music was Holmes playing on his gramophone in order to fool his visitors?